A Ride to help homeless animals and Sandy Pines Wild life Centre Sunday Aug. 25th we meet at City Hall Parking lot for a meet and greet then an hour long ride though Beautiful Wooler, Stockdale, Frankford, Stirling, on to Loyalist College Road back to Q.H.S. for a bbq and prizes. Last year our first ride had one hundred Motorcycles this year with a lot more time and flyers we are hopping for 200-300. 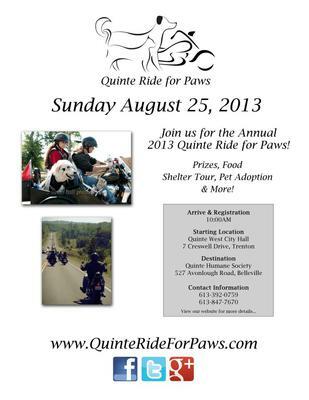 Look up Quinte Ride For Paws on face book. Or contact number is 613 392 0759. Join in and write your own page! It's easy to do. How? Simply click here to return to Pay it forward ->.